What does China attract you most? Is it its culture, language, landscape(风景) or its people? The culture—I grew up with two cultures and I love Chinese New Year and the way how elders are treated in China. The language—I can speak a little Chinese because it sounds beautiful to me. Hopefully I will go to China and see how it is. It is the country of the dragon. I like the spirit(精神) of the Chinese people—they are confident in their own abilities, their culture and people. I admire their hardworking spirit and belief in themselves that they will build up their own strong and independent country. 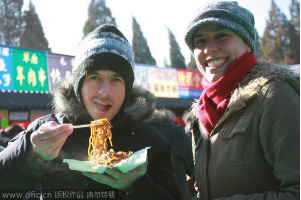 The food in China is really delicious. The people were also amazing, friendly, weird but in a nice way. When I first came to China, I was really nervous. But the people are so friendly and helpful. I will be coming back as long as time and finances allow. Hopefully by then I will speak a bit more Chinese. 1. Who can speak a little Chinese? 2. Kiyer thinks the Chinese people are very ______. 3. The underlined word “weird” means _______ in Chinese. A How to get on well with Chinese. B Chinese culture and customs. D What I like most about China.